This new feature is cool in many ways but one reason why is that I remember reading somewhere like the Augi wish list (http://www.augi.com/wishlist) or even on twitter that Jimmy B from http://www.jtbworld.com/ simply wished that he could easily select the layers from the Layer Proprieties manager and tell them to merge into another layer. And the next thing you know, that same feature shows up in AutoCAD 2014. So it is cool to know that Autodesk listens. This new feature is really as simply as described above. Select the a layer from the pop-up box. These are layers that were not included in the selection of layers that you previously made because these are the “destination” layers. If you do not see your destination layer in this list, it is most likely because it was included in the selection of layers. So you will need to back up a little and re-select your layers. This time DON’T include the destination layer in the selection set. The result is that the Layers and all of their objects have been merged into the layer that you specified and the old layers have been purged from the drawing. This entry was posted in BASICS, Layers, New in 2014. Bookmark the permalink. Thank $Deity. I was actually going to write a plugin to do this. I was going to implement it as a drag-drop experience – select the defunct layers (use the control key to select non-contiguous multiples, shift key if they are all together) and drag them onto the layer you want to merge them into, confirm, done. It’s a shame one can’t extend things like the layer palette to do that. Still, this is progress so it must be acknowledged and rewarded in the fond hope they do it again! I think that you should still make the plugin and put your spin on it. There are plenty of users that don’t update to the newest version so they would defenifitely benefit from the it. At work, we don’t update but every 3 releases. So we just updated to AutoCAd 2013 and have to wait to AutoCAd 2015 to be able to take advantage of the newest features. How do make the layer merge visible / or able to click if it is greyed on Layer Manager even two or more layers has been selected. This is really useful! Thanks! And what if ‘merge layers to’ is missing from the drop down? I have the same trouble at work, I would need to merge many layers together. 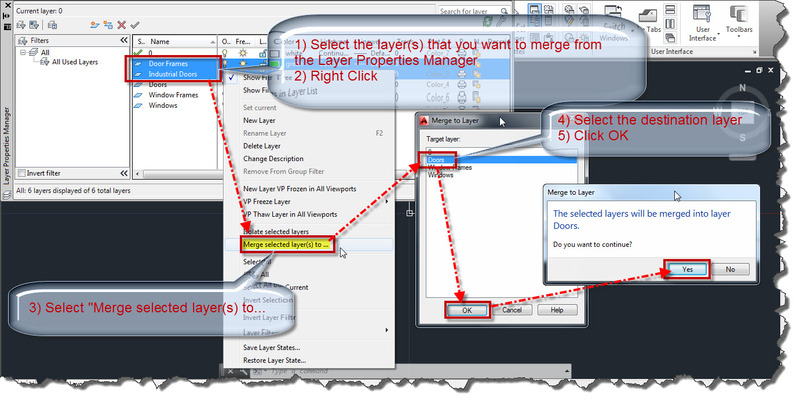 But the option ” Merge selected layer to…” is not visible. I use AutoCAD 2013.